Looking for fun ideas for kids or yourself? Stuffing zucchinis, peppers and pumpkins are always a hit and delicious. This recipe uses zucchinis as the “boat” but you can substitute in bell peppers, a squash or pumpkin as well – you just may need to adjust the filling quantity. This dish is full of B vitamins, folate, omega 3s, calcium, iron, protein, potassium and magnesium – great brain food! 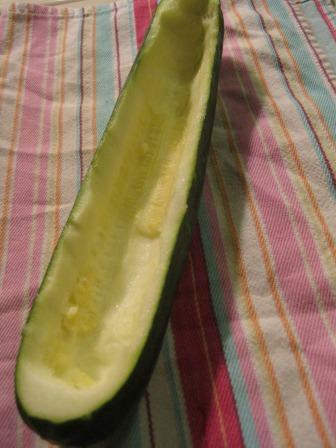 Slice off the top layer of your zucchinis using a knife and then scoop out most of the guts – leaving you a “boat” (see image). Heat the oil in a frying pan and add in onions, garlic, celery and mushrooms. Saute for 2 minutes then add in the bouillon powder. Allow to simmer for another 3 minutes. Turn off heat and add in quinoa, basil, salt and pepper. Mix thoroughly and spoon mixture into the boats. 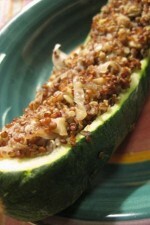 Place the zucchini lid back onto the boat and bake for 40 minutes. To increase the anti-inflammatory potency of this meal – serve with a filet of salmon or halibut.